Blood clotting functions primarily to repair and prevent bleeding from an injured vessel. However, because of the triad of inflammation, hypercoagulability, and endothelial injury, clots can form within blood vessels.1,2 Venous thrombosis accounts for more than 600,000 hospitalizations annually.1,2 If left untreated, venous thrombosis in large vessels can lead to pulmonary embolism, so that it a significant cause of morbidity and mortality.2 Although the pathophysiology of blood clotting is well understood, the treatment has varied greatly over time. In the early days, vessel ligation was a common practice, although swelling and pain in the affected extremity were frequent complications. Later, immobilization of the extremity was the standard of care, although it left the patient immobile, further increasing the risk for clot formation.3 It was many years later that anticoagulation therapy evolved as the standard of care for patients with blood clots and deep vein thrombosis (DVT). Anticoagulation was initially accomplished by administering heparin along with warfarin, a vitamin K–dependent anticoagulant.3 Although heparin and warfarin were and still are a good option for anticoagulation, ongoing monitoring of the patient’s prothrombin time (PT) and international normalized ratio (INR) is required to identify and maintain the appropriate dosage. Within the last few years, medications belonging to another class, the new oral anticoagulants (NOACs), have emerged as safe alternatives to warfarin and do not entail the requirement for intermittent measurement of the PT and INR. It is essential that physician assistants understand the pathophysiology of clot formation and DVT, recognize the signs and symptoms of DVT in clinical practice, and be knowledgeable about the new anticoagulants and evidence-based treatments for DVT. 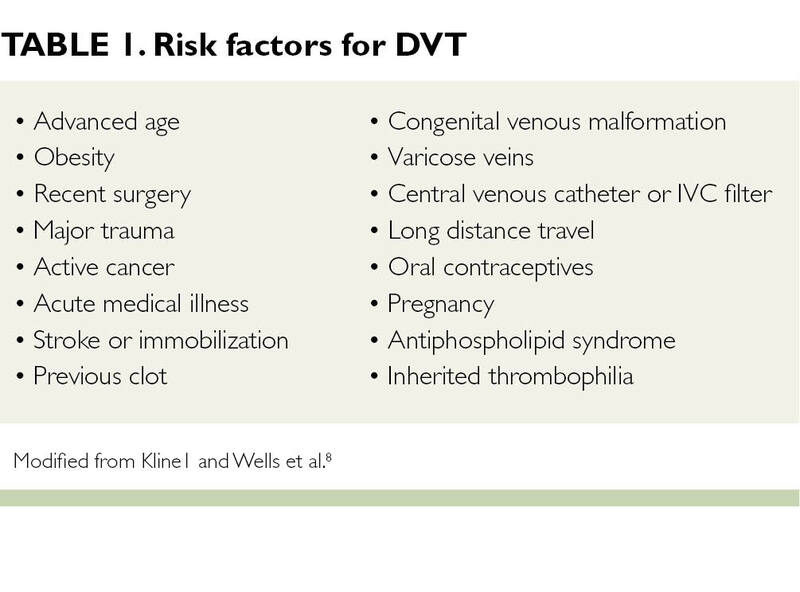 Which of the following tests do you most frequently recommend when you suspect a patient may have DVT?